LSBU continues to invest in energy efficient technology, processes and solutions to further reduce our consumption of electricity and gas – both within our residential and non-residential estate across both our Southwark and Havering campuses. Our Maintenance and Energy Manager (located within LSBU’s Estates Department) is the driving force behind achieving these reductions, with support from the Sustainability Team too. These results have been achieved by combining leadership and good governance, by working in partnership with in-house teams and external service providers as well as engaging our staff and students. This focus on energy efficiency has demonstrably driven down our carbon emissions year-on-year and created continuous improvement towards our HEFCE target. This investment includes upgrading controls to optimise building operations and LED lighting upgrades in some of our largest buildings. 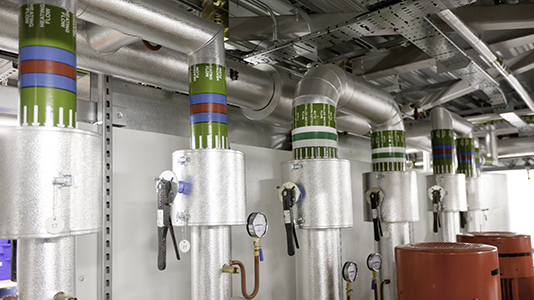 LSBU has been adopting a “micro-management” approach to energy conservation. For example, optimising building management system requirements, increasing the use of degree day data and using environmental analysis and diagnosis techniques to ensure day to day operations are running as efficiently as possible. All this activity has resulted in a drop in use of more than 11 million kWh of energy (electricity and gas) since 2010/11 and the University has reduced its carbon emissions by around 5,000 tonnes during the same period. At the start of the new academic year in August 2017, we will appraise the scale of the our achievement towards our HEFCE carbon target (35% by 2020) and investigate setting a more challenging carbon reduction target, as the University is likely to have achieved its absolute carbon reduction commitment in advance of 2020. LSBU’s School of The Built Environment and Architecture are leading on The Balanced Energy Network (BEN) project at the University. It is an Innovate UK funded research project running from May 2016 to May 2018. BEN combines next generation heat networks with smart-grid technology to balance the production of heating, cooling, and electricity in a way that minimised costs and carbon emissions. Find out more about the BEN project. Whilst at LSBU, Student Anja Fischenich created The Great Carbon Footprint Game in partnership with the Sustainability Team. The central purpose was to help to increase the carbon literacy of both staff and students. Anja received a Highly Commended award at the Green Gown Awards in 2015 for her work.